We’re not out of the woods yet when it comes to fleas and Southern California Weather. While the rest of the country is buried deep in snow, we here in Los Angeles are still having 80 degree days in the “dead of winter”. While this is quite pleasant in many ways, there is one major downside when it comes to pet owners. You guessed it, fleas. Our dog Orion has never really had a huge issue with fleas, but my boyfriend and I are quick to get rid of them as soon as we suspect an infestation i.e. overtly energetic scratching, biting, and chewing. As soon as Orion begins these characteristic signs, we’re on it! Here is a recipe for a natural flea shampoo that is gentle yet very effective. 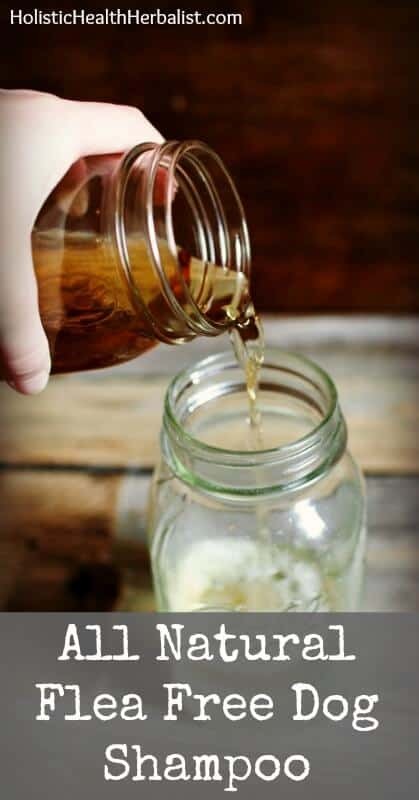 You’ll be finding dead fleas for days afterward with a fine flea comb after using this homemade shampoo. The proof is in the pudding as they say, and this is no different. Funnel everything into a shampoo bottle and shake it up really well before each use. Get a really good lather going and let the shampoo sit on the dog (or cat) for at least 10 minutes before rinsing. Some dogs won’t want to sit still this long so my boyfriend will usually use this time to brush Orion’s teeth which takes a good 10 minutes anyways. Once your dog has soaked in the natural flea shampoo a bit, rinse them thoroughly and dry as usual. Comb the dog with a fine comb for several days afterward. In conjunction with a good ol’ flea bath I often use a natural flea spray in my home or sprinkle cinnamon on the carpets before vacuuming to make sure my house stays flea free! Want to know what’s really cool? DogOsuds organic shampoo is EXACTLY this, already made! It works like crazy on fleas and also on itchy, allergy skin! Where can you DogOsuds? I live in South Carolina and my small dog gets fleas all the time and he has been allergy skin.